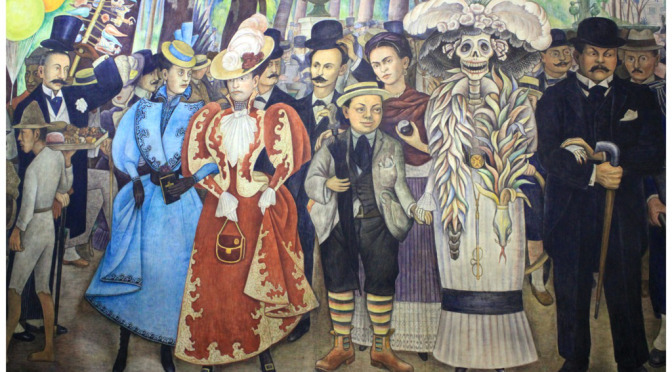 The center scene of Rivera’s mural (pictured) has been described as a snapshot of bourgeois life in 1895 Mexico — refined ladies and gentlemen promenade in their Sunday best, oblivious to the activities of the impoverished peasants going on around them. The centerpeice contains the image of José Guadalupe Posada’s “La Catrina Skeleton” character. La Catrina was a slang term used in early Twentieth Century Mexico, to describe an elegant, upper-class Mexican woman who dressed in European fashion. The depiction of La Catrina as a skeleton was understood to be a critique of the Mexican elite.